What's the best crappie bait to use for catching these spunky fighting papermouths? We're talking about bait, not artificial crappie fishing lures, right? 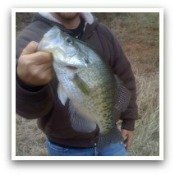 It should also be fair to mention that live bait can outperform dead bait or even artificial baits for crappie fishing. Crappie are known to eat a variety of bugs, insects, small bait fish, and crustaceans. Let's go over a few more factors to help increase your chances of getting more crappies to bite. To get straight to the point, minnows have to be the best and most effective crappie bait. They are widely used everywhere by most crappie anglers. Minnows are a prime meal for crappie. There's not much of a chance for the minnow when Mr. Crappie is around the neighborhood. Those crappie can hardly stand it, because those minnows are just too difficult to pass on. Often times, the minnow is set out under a bobber, which can be tossed out with or without a weight, or are used in ice fishing. Small minnows that range from 1 to 2 inches are best to use. Use the larger sized minnows during the warmer months of spring and summer, as the bait fish in the water will naturally be bigger from feeding on the forage during these times. And of course, smaller minnows during the cooler times of the year. Another amazing and favorite crappie bait is a good old time faithful worm. 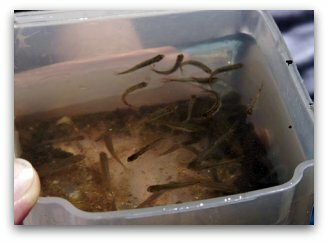 Worms, such as night crawlers, meal worms, earthworms, wax worms and small blood worms are all excellent baits to use for catching crappie. You can pinch off some of the excess worm from the bottom of the hook, especially when the crappie are short biting it. Another good alternative is to use a set of gang hooks. Get to know a little more about worms as fishing bait, and find out are worms the best fishing bait for catching any and all species of fish. There are some other notable things to think about. Juvenile crappie will feed on small insects and bugs. As they mature into adulthood they begin feeding more on bait fish. However, black crappie will still feed on bugs throughout their adult lives. 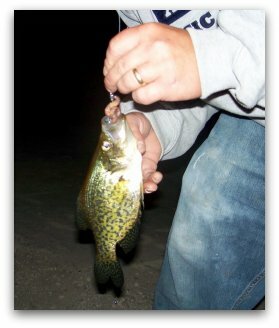 Crappie will also feed on small crustaceans such as little crayfish. So consider using bugs and insects as crappie bait, such as crickets, grasshoppers, leeches. And use maggots if you can stomach the mere thought of them nasty little buggers. You can catch your own baits like these. Or they can be found for sell at many bait and tackle stores like Bass Pro Shops. I've been able to find boxes of live crickets to be sold at local pet shops, usually near the reptile section. They can usually last up to around a few weeks after they have been opened. Other options to creatively think about considering can be the feeder fish from your local pet supply stores. They're usually orange, or sometimes white or black. Because of their relatively small size and shiny orange colors, they fair nicely for attracting some quality crappie. If your able to, you can catch your own live bait fish with a throw net. Most of any type of small bait fish should produce well. Small threadfin and gizzard shad, ship jack, smelt or small fry species of other game fish are some examples. Smelt is considered as an endangered species in some areas of water throughout. So be sure to understand the laws and regulations before you follow through with netting your own live baits.